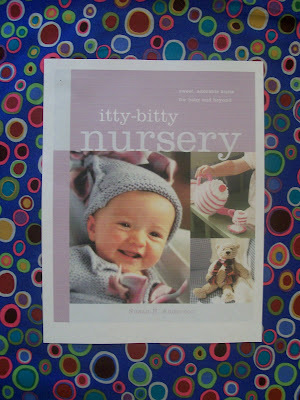 Here is a peek at the cover for my second book, Itty-Bitty Nursery! I am so happy with the cover. The bear is made from all garter stitch squares, much like the booties I am about to share with you. This same bear is pictured in Itty-Bitty Hats above the dedication at the beginning of the book. I have been asked and emailed more times than I could count for this bear pattern. Well, soon it will be available in the new book. Also on the cover is a knitted tea set called The Cupcake Tea Set. This is one of my favorite all-time projects, so I am glad it made it to the cover. The other baby set is a hat, cardigan and bootie ensemble all made super easy, but with great style. It is set to be released in October 2007. Fun, fun, fun! The other two patterns that I get requests for almost daily are both projects pictured on page 81 in Itty-Bitty Hats. 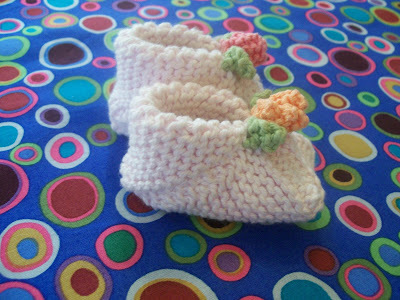 Today I am going to give you a tutorial on how to make these booties. Let me start by saying I have seen variations of this same style of bootie done many times and many ways over the years. I didn't invent the folding technique for the toe and cuff. Anyway, here is my un-vented variation of these shoe-like booties. 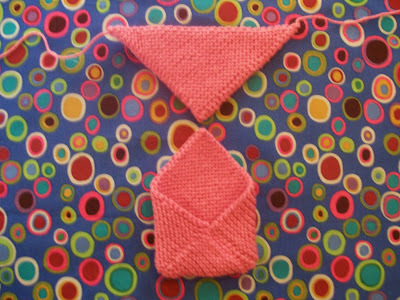 You will be knitting 6 garter stitch squares. Three squares are used for each bootie. I wanted to make a tightly knit fabric so when seamed together the squares would hold the form of the shoe. If you would like a looser fabric, you could use a larger needle when knitting your squares, just be sure to measure your gauge to figure out the square measurements. You need to have an exact square for all three pieces when putting each bootie together. With Shell cast on 21 (24, 27) stitches. Work in garter stitch (knit every row) until the piece measures 3 1/2 (4, 4 1/2) inches from the cast on row. Bind off. Repeat until you have 6 squares completed. Take a look at the seams from the side. Let's start the sewing together of the squares and the folding. 1. Take 2 squares and lay them directly on top of each other. With a length of matching yarn and a yarn needle, whip stitch around all four sides of the square seaming the two squares together. Now you have a square that is a double thickness. This piece will be the toe and foot of the bootie. 2. Take one more square and fold it in half to form a triangle (see below). With a length of matching yarn and a yarn needle, whip stitch around the two edges to seam together. Now you have a triangle with one folded edge and two seamed edges. This piece will be used for the cuff of the bootie and is now a double thickness. 3) Take the double-thick square and fold 3 of the corners into the center, leaving the fourth corner alone. Sew these 2 seams together. You now have a toe that looks like an open envelope. 4) As shown above, the fourth corner will match up with the sewn corner of the triangle. The folded edge of the triangle is the cuff-edge of the bootie. 5) Because you have knitted equal sized squares these side edges will match up perfectly. Line up the sides of the foot piece with one of the sewn edges of the triangle, as shown above. With a yarn needle and a length of matching yarn, sew these edges together on both sides of the foot opening. You have done it. Now you know the secret to these cute little booties. The patterns for the rosebuds and leaves are in Itty-Bitty Hats on pages 79-80. I am not allowed to re-print those patterns here. Before you sew the triangle together, you could lay a length of ribbon, i-cord or braided yarn through the cuff before sewing the sides together. I pictured a pair of white booties with a braided tie a couple of posts ago. Cast on 40 (48, 56) stitches. Work every row like this until you have a piece measuring 3 1/2 (4, 4 1/2) inches from the cast on row. Complete the cuff as described above. Fold and complete seams as described above. I hope you enjoy. Please send me pictures if you get a chance. Pretty stuff, that will be perfect for when my friends start having babies!!! Thank you very much! I'm off to get started! Baby Emmy has just turned 5 months! The book looks great - can't wait to get a copy for myself! Thank so much for the pattern! Those booties are so darn cute! Thank you, thank you, thank you for the pattern! Can't wait to try! I recently picked up "Itty Bitty Hats" and have been having so much fun. I noticed the booties in a picture and fell in love. 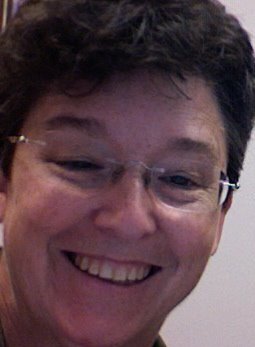 I was googeling to see if you had another book that might have them and ran into your post. I am giddy. A set will be on my needles tonight. I can't wait to pick up your new book. This bootie pattern is genius! I have already assembled one bootie and am in the process of assembling its mate. I love your book "Itty Bitty Hats" and I am so excited about your new book! I love your book, Itty-bitty Hats! I have knit the upside down daisy and am finishing the rosebuds for the rosebud hat (wreath). 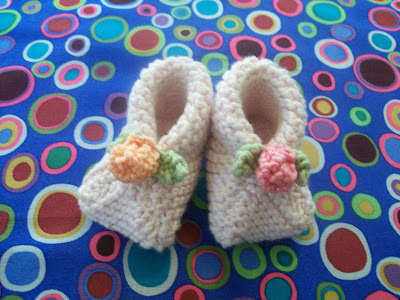 My youngest granddaughter is due in June so I was excited to see the rosebud booties on your website. I also finished the football helmet for my newest grandson. I am eagerly awaiting your new book in October. Thank you again for the booties. Thanks so much for the bootie pattern. Will we be able to pre-order your new book? 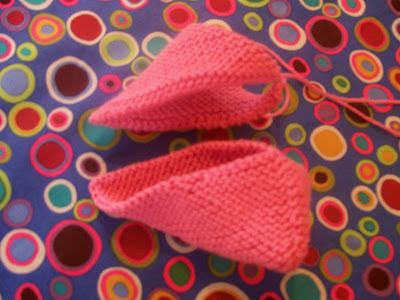 Thank you so much for the pattern for these wonderful little booties. Can't wait to make my first pair! thank you so much for the pattern for these wonderful booties. Can't wait to make my first pair! Susan, thanks for this pattern. I'm a crocheter, but I've been wanting to make booties like this. So I've just made squares and it worked out great! Thanks! Oh wow these are adorable. I bought some yarn for a project that turned out to be the wrong weight altogether. 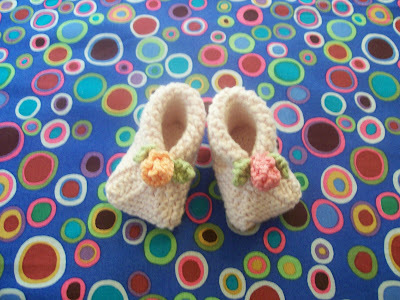 I was looking on Ravelry for something I can do with it, and ran across these booties. I have a friend who's expecting, so I know what I'm making now! Thank you for sharing this! Absolutely gorgeous! Thanks so much for sharing the instructions with us, will have a go when I find the 25th hour in my day! I can't thankyou enough for sharing these booties - they are just so cute and will be perfect to make for my great neice Faryl Evie. But aren't the feet of these booties awfully thick? I live where it is only cold for a little while in the winter, most of the year babies would not need a double-thickness bootie. Maybe make ONE square, sew the points up. and only half the seam on each side for the 4th point, letting the last bit of triangle fold down the back as a cuff? This is WONDERFUL! I think I might try to up the size using VERY heavy yarn and large needles to make adult size slippers for he holidays... what do you think? do-able? I am new to knitting. I purchased Itty Bitty Hats and am working on my third hat. I love the clear-cut instructions. However, in the book it looks as if the edge of the hat rolls up just a little. The edge of my hats want to roll up about 2 inches. I try 'un-rolling' the edge and the rolled edge seems to just want to roll up more. What am I doing wrong? Sharon, The hats will roll up less once they are on the baby's head. Don't worry about it at all. I am glad you are knitting. I am making the rosebud hat and would LOVE to make that rosebud cardigan for my granddaughter to match. Anyway I could make it in an 18 month size? The pattern for the rosebud pattern is only for an 18-inch doll size. Thanks for sharing,I will surely try these booties,God bless you. I have just stumbled across this beautiful pattern of yours and I just wanted to clarify something. Are the needles US size 3 or UK 3mm? Also, is the yarn double knit thickness? I loved the way You have do to make that Amazing litlles shoes! Thank you to share with us.I wish God bless You.